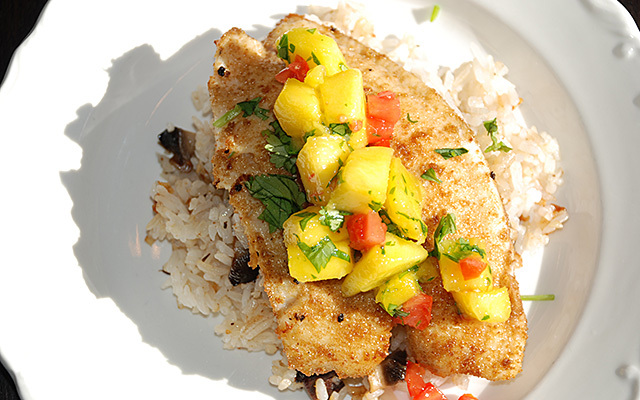 I love the earthy flavor of this dish paired with the freshness of the mango salsa. When my family wants a break from eating red meat, I prepare this dish for a light, healthy alternative. 1. Season tilapia fillets with salt and pepper. 2. Rub cumin and coriander all over tilapia fillets. 3. Melt half of the butter on a skillet over medium high heat. Add 1 tablespoon olive oil. 4. Pan-fry half of the tilapia fillets until cooked through. 5. Do the same for the rest of the tilapia fillets, using the remaining butter and olive oil. 4. Serve with mango salsa over steamed rice. For the mango salsa: Combine all ingredients for the mango salsa in a bowl. IF possible, refrigerate for 1 hour to let the flavors marinate.